For many anglers, the word catfish conjures up thoughts of heavy line, circle hooks and bait so smelly you don’t dare touch it with bare hands. Fishing for catfish is a popular summertime activity. Rods can be propped up with a stick and one can pull up a lawn chair and wait for a channel cat to sniff out your bait. The truth is, these whiskered critters can also be caught in the dead of winter. Many of Iowa’s lakes and ponds contain channel catfish, and pulling them through an ice hole with light line and an ice rod can be a blast. Refining your usual panfish tactics with a focused approach to Mr. Whiskers is usually all it takes. Channel catfish are omnivores, and in addition to eating dead, decaying fish, they will eat almost anything that will fit in their mouth. For this reason, these fish are stocked in lakes and farm ponds to help control panfish and bullhead populations. Stocking reports can be an good indicator of what bodies of water contain good numbers of catfish, but if stocking reports aren’t available you can bet your favorite farm pond that has been stocked with bass and bluegills, also has been stocked with channel catfish. In small ponds, channel cats usually seek out the deepest water available. Consequently, these are some of the same areas crappies and bluegills generally seek out in the middle of winter, and it is not uncommon to hook into a catfish while fishing for panfish. 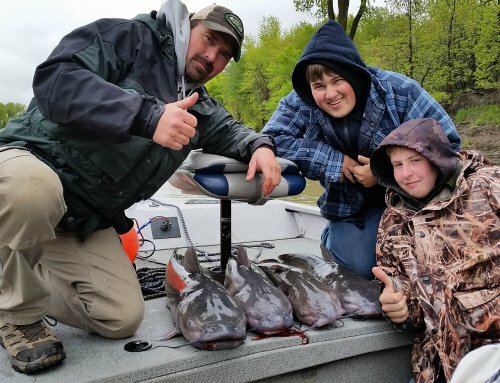 While panfish might cruise around a basin and suspend throughout the water column, catfish seem to be less mobile and hang out in depressions near the bottom. If there is a one or two foot depression in the main basin of a pond, it is a good place to start looking for catfish. Good electronics can help to identify these areas. Drill several holes over the main basin and look for areas that are slightly deeper than the surrounding water. Other areas to try include the base of drop offs or structure like brush piles or rocks. These fish are feeding on insects and larvae emerging from the bottom, so muddy bottom areas or areas where bottom composition changes could hold catfish. I’ve often found catfish to congregate in schools, where numerous fish can be caught in a few minutes. When using electronics, often single marks will turn into several. 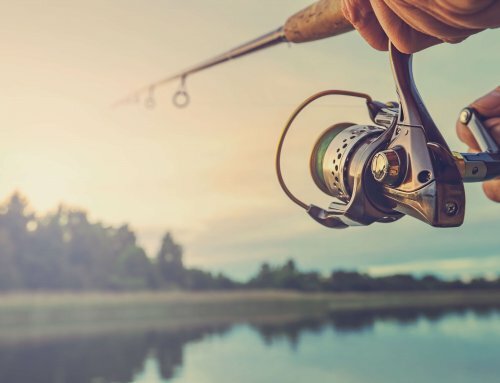 This is your chance to catch one or two fish, because the schools can disappear just as fast as they arrived, and then the search is on again. Locating catfish in larger lakes can be a bit more difficult. Deep water is still the key. If catfish are caught in a specific spot during spring and summer, look for deep water adjacent to those areas. Try to split a larger lake into sections and fish the deepest depression of the sections. Sometimes these fish will be in 30-40 feet of water or more and will suspend off of the bottom. Again, electronics are key to locating fish in these areas and you may have to drill a lot of holes over these deep areas before locating any fish. Electronics with zoom features can be extremely useful as catfish will sometimes hug the bottom making them hard to identify. Often times locating catfish comes by accident. Some of the best days catfishing start as a search for panfish and quickly turn after a good sized catfish is hooked. If while fishing for panfish on a water body, you hook a channel cat, key in on that area and try locate a school. I like to stay mobile when searching for fish and I won’t set up an ice house until I’ve found a good school. Often times, jumping from one hole to the next is much more productive than sitting on one spot. While summertime catfish prefer cut bait, stink bait and night crawlers, wintertime catfish prefer smaller offerings. In the winter, as with all fish, the metabolism of catfish slows. While hanging out near the bottom, they likely feed primarily on insects and their larvae. The most effective baits I’ve found are wax worms and spikes. I generally fish them just like I would panfish, however with a slightly larger “tear drop” style jig. Make sure the jig has a good, strong hook, as catfish will straighten out flimsy hooks. Glob on 4 or 5 spikes or wax worms and fish them near the bottom. Jigging spoons can also be effective with either maggots or minnow heads, and I have also caught catfish on live crappie minnows fished below a bobber. 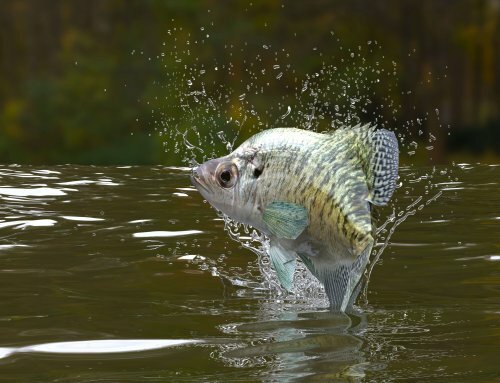 Larger baits, like jigging spoons give off more flash and vibration and will attract more fish, however, using panfish sized jigs is nice, because panfish and catfish can be caught out of the same hole. When fishing deeper water, an 1/8 oz lead head jig or a jigging spoon will allow your bait to get down faster than a smaller jig. If a school of fish is located, it is important to get the bait down fast before the school moves on. Another bait option is dead minnows, fished below a bobber. If fish are less active, a more subtle or motionless approach may be effective. In this case, dead stick the minnow, hooked behind the dorsal fin on a bare hook six inches to a foot off of the bottom. One noticeable difference about catching catfish is the way they bite. While panfish will give a small tap or tug, catfish will just feel like dead weight. Either you will go to jig your bait and feel them then or you will see the tip of your rod start bending slowly. If using a bobber, sometimes a channel cat won’t pull it all they down, but rather grab the bait and sit with it. Any bobber movement could indicate a strike, and on some days that’s the time to set the hook. I prefer a superline, such as Berkley Fireline Crystal or Suffix Ice Braid, because it allows for better feel in deep water. A good medium light to medium action ice rod is ideal for these hard pulling fish, but often times I catch them on my panfish set up with an ultra light rod and two or four pound test line. With the drag set correctly, it is an exciting battle on panfish gear. Getting a catfish’s bulky head through a hole can be difficult. I have witnessed an angler hook a catfish and get it to the surface, only to find that it would not fit through his six inch hole. Catfish can lock their pectoral spines (the same ones you must be careful of when grabbing them) which makes the width of their head even greater. I would recommend at least an eight inch hole to be safe. Catfish can be caught throughout the day, but they seem to be most active during early morning and at dusk. They will also continue to feed after dark. During prime times I have witnessed catfish rise up several feet off the bottom to bite an offering and at times the bite can be fast and furious. As I’ve described, many of the techniques that work best for catfish are the same that work well for panfish. When fishing a new pond, and you begin marking fish with electronics, a panfish sized offering should suffice for getting almost anything to bite, and you’ll definitely know if you hook into a good sized catfish. 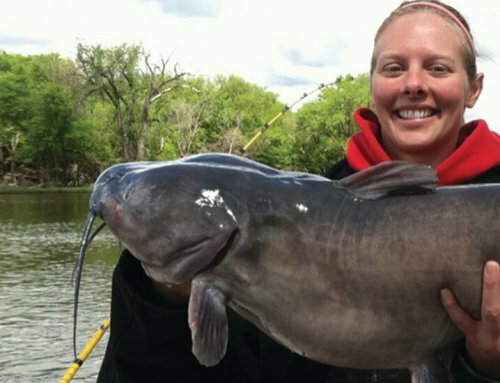 Channel catfish are common in many of Iowa’s water bodies and they can provide an exciting winter fishing opportunity. They provide a unique, rod thumping fight unlike any other fish caught through the ice. 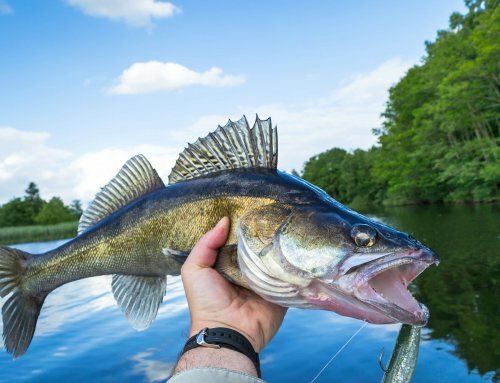 By using many of the same fishing techniques you are used to, you can catch some of these hard fighting fish with gear that you already have. Not many anglers target catfish in the winter, so they can provide a pressure free fishing alternative to walleyes and panfish, and not to mention when prepared properly, catfish are some the of the tastiest of all game fish.